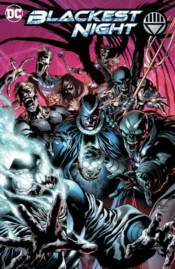 The war between the Corps rages as the prophecy of the Blackest Night descends on the DC Universe! Can Green Lantern Hal Jordan lead DC's champions against an army of Black Lanterns made up of deceased heroes and villains? This massive hardcover collects Blackest Night #0-8, Adventure Comics #4, 5 and 7, Blackest Night: Batman #1-3, Blackest Night: The Flash #1-3, Blackest Night: JSA #1-3, Blackest Night: Superman #1-3, Blackest Night: Titans #1-3, Blackest Night: Wonder Woman #1-3, Catwoman #83, Green Arrow #40, Green Lantern #43-52, Green Lantern Corps #39-47, Phantom Stranger #42, The Atom and Hawkman #46, The Power of Shazam! #48, The Question #37, weird Western Tales #71 and more!